Bobs look cute curly and wavy, but the shape of your hairstyle will really shine and flatter when you blow dry it smooth. If you simply attack your hair with a blow dryer, what you intend to be a sleek look will likely end up a wild mess. 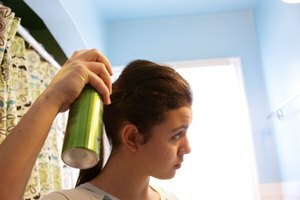 Bad blow drying not only looks bad, but it can damage your hair. A few simple tips and tricks can keep your bob out from under a scarf or hat. Wash and condition your hair. At the end of your shower, rinse your hair with cold water, as it increases shine and reduces frizz, according to "Seventeen" magazine. Squeeze excess water out of your hair. Then use a towel to squeeze and blot out any remaining water. Apply heat-protecting serum or frizz-reducing serum while your hair is still damp. Doing so helps ensure your locks blow out smooth and shiny instead of dull and poofy. Use clips or bobby pins to separate your bob into four large sections. Pinning your hair back in sections makes it easier to get to the hair you're trying to work with. Free a 3-inch section of hair and run your fingers through it to get any tangles out. 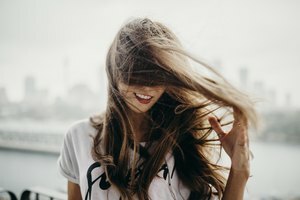 Run your fingers through again, but this time pull your fingers about 4 to 6 inches from the scalp and hold the hair tightly between your fingers. Blow dry on a medium setting from the roots to your fingertips to smooth the areas closest to your head. These hairs are hard to smooth with a brush because the brush can't always get close enough to the scalp. Sweep the 4-inch section onto a brush using a downward motion. Choose a paddle brush for sleek, smooth, straight styles or choose a round brush for curls, waves and texture, recommends Karen Marie Shelton of Hair Boutique.com. 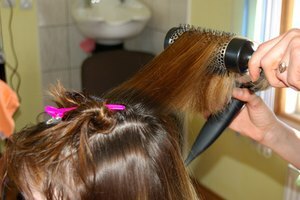 Aim the blow dryer at the brush and pull the brush and the blow dryer downward slowly in one smooth motion, sandwiching the hair between the two. 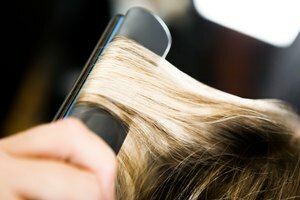 If the hair isn't smooth and straight after you've blown out the whole strand, repeat the motion on a higher heat setting. Once smooth, hit the section with a burst of cool air from your blow dryer's cool air setting to close off the cuticle and lock in the style. Repeat, blow drying your hair one small section at a time, using a slow, downward motion, until you've blown out your entire bob. Flip the ends of your bob under or upward with a round brush to add curls or waves to your look. Mist your hair with a light shine-enhancing spray. Style or make changes to your bob, but touch your hair as little as possible from this point on. Once your hair has dried, the natural moisture from your hands can cause frizz. Lock in your look with a few spritzes of a light hairspray that still allows your strands to move. Start at the back of your head and work forward if you have frizzy, curly or hard-to-straighten hair. The back tends to be more difficult to blow out and probably requires the most time. Avoid blow dying your bob every day to avoid damage.